Visiflon was previously named Hyperline V - either name applies, but Visiflon is now the conventional name applied. This convoluted liner design makes the hose very flexible and very kink resistant across the size range. Visiflon GP, TO	- Natural PTFE Tube Only, No Braid. Visiflon GP, AS, TO	- Antistatic Black PTFE Tube Only, No Braid. Visiflon GP, SS	- Natural PTFE Tube external AISI 304 Stainless Steel Wire Braid. Visiflon GP, AS, SS	- Antistatic Black PTFE Tube, external AISI 304 Stainless Steel Wire Braid. *Visiflon GP, PB	- Natural PTFE Tube, Orange Polypropylene Yarn Braid. *Visiflon GP, AS, PB	- Antistatic Black PTFE Tube, Orange Polypropylene Yarn Braid. When electrically resistive fluids like solvents and fuels, or multiphase mixtures are passed through natural PTFE hose at high flow rates, a static charge build up occurs on the inner wall of the PTFE liner, which eventually discharges to the nearest earth creating a leak path through the liner. Antistatic PTFE includes a small quantity of a special carbon black which ensures safe static charge dissipation, in accordance with International Standards. 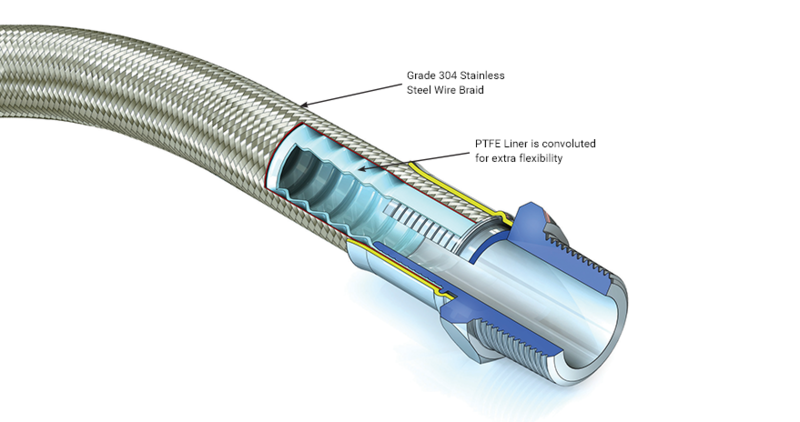 The braid protects the PTFE liner tube against internal pressure and mechanical abuse. The braid is lighter in weight than SS braid, and any ends broken in service will not cut an operator’s hands. Operating Temperatures & Pressures, however are limited. *Note: PB Grades are usually only available to Special Order.